I took my son to the orthodontist today, and when we emerged from the office, I was thinking about dinner. Mac and cheese—just in case the teeth were hurting—and … well that was where I was stuck. I know he’s not a fan of zucchini, so I was not surprised when he said, “I’ll take broccoli,” even if it meant a stop at the market. But when we got to the checkout, he also took a Three Musketeers and a package of Skittles. He’d already been out biking after school, and I don’t buy him candy very often, so I bought them. In the car, he opened the Skittles. I held out my hand expectantly, but he just looked at me, feigning ignorance. I raised my eyebrows, my silent gesture for, I-paid-for-those-I-can-take-them-away. “What colors do you like?” he asked as he dumped a small pile into his hand. “Red, orange, and yellow,” I answered, turning my eyes back to the road, but leaving my hand out. He plucked three Skittles from the pile and placed them in my hand. Two orange and a red. I ate them while we chatted about the day. As we got closer to home, I held out my hand once more. Again, he placed three Skittles in my hand, this time, an orange, a red, and a yellow. We listened to the political discussion on the radio. He chewed away on his candy, but he didn’t offer me any more, and I didn’t ask. We turned into our road, and he read the nutrition information on the package. “Whoa!” he exclaimed. I opened my mouth to say something. 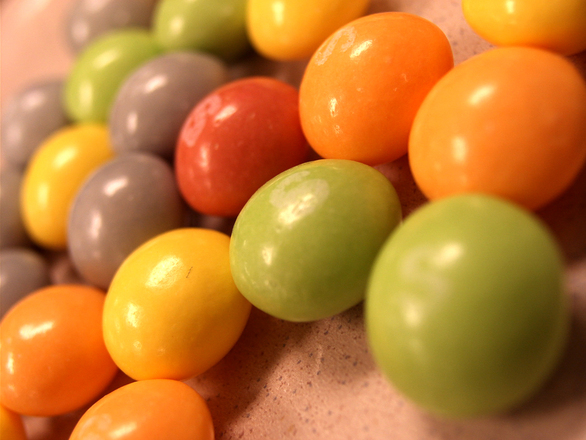 Something about the six Skittles I had eaten to his all-the-rest. But I closed my mouth. I’d let him have his faulty logic. At least this time.